Tencent, who among other services operates QQ, the most popular instant messenger in China, or Qzone China's (or maybe even the world's) largest SNS, yesterday accounced that it will soon open up for third-party applications (original Chinese news report by Sohu here). 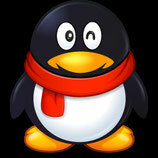 This announcement came after several other Chinese Internet companies recently opened their respective platforms. Tencents CEO Pony Ma stressed two points for applications to be allowed: innovative products and high security standards.